He is risen. C: He is risen indeed. He is risen. C: He is risen indeed! This is the central claim of the Christian faith – that Jesus Christ, a carpenter who became a traveling preacher and teacher, who was proclaimed at his baptism to be the son of God, was crucified, died and was buried – and on the third day he rose again and has become Lord of all. I have a choice to make for an Easter message today. I could focus on the reaction of the apostles to the woman’s testimony that Jesus had risen from the dead, that it seemed to them a bunch of hogwash, which is what the phrase “idle tale” means. And I could give an argument for the fact of Jesus’ resurrection. I could try and debunk the theories that Jesus just passed out on the cross; or that the disciples were hallucinating when they thought they saw him; or that the disciples stole his body; or that the disciples just made up the whole thing. I’m going to take you back to the beginning of the Bible – all the way back to Genesis, where, in the beginning, we are told that God created the heavens and earth, and we are told, in these opening verses of the Bible, that the earth was a formless void A void means nothingness, emptiness. And out of that emptiness, with simply a word, God creates life. You remember the story, “And God said, ‘let there be light,’ and there was light.” Then God spoke into existence the sky, sun, moon, stars, then plants and trees and vegetation, then fish and birds and animals – and finally, humans. It is the beginning of a pattern – out of emptiness – life, spoken into existence by the very word of God. • From the barrenness of Sarah, whose womb had been empty for 90 years, God speaks a word and tells her that she will give birth to a son – and from that child a nation will grow. • From the emptiness of slavery in a foreign land, God speaks a word to Moses and says, “I have heard their cry,” and God brings forth life, exodus, and freedom for his people. • Out of the empty womb of a virgin, God speaks a word through his angel Gabriel, and says to Mary, “The Holy Spirit will come upon you…and you will bear a son.” And God brings forth life – Mary gives birth to Jesus, the very son of God. 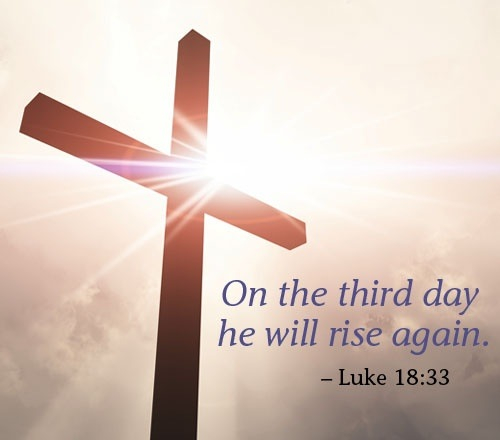 • And out of an empty tomb, the Son of God, who told his disciples three times during his time with them, “On the third day I will rise again,” does indeed rise to life, resurrected life. Jesus is no longer in the grave, he is risen. And the pattern continues – emptiness, a Word from God, and life – a pattern that has woven its way through the biblical story from the beginning. And so the Easter story is nothing new from God’s perspective, but rather a continuation of the old story – a story of a God who is constantly bringing about new life even in the midst of the most barren and empty of times. So, what difference does the resurrection of Jesus make for us today? I heard about a church that had a neon sign out front for Easter that read “His grave is empty, will yours be?” I’m not sure what the Easter message was going to be at that church, but what bothered me more was that the question itself seemed like a threat. Believe this, or else. Perhaps that is why people these days have trouble believing, because we’ve managed to turn the good news into something else – it is no longer heard as a word of hope spoken into the emptiness of our lives. The good news of the resurrection is that there is hope – real hope, lasting hope, indestructible hope. • It means that when we’re drowning in guilt over mistakes made or deeds left undone, we can know that on Easter morning, Jesus conquered sin, and we have complete and total forgiveness. • It means that when someone we love dies, or we are facing death, we can know that on Easter morning, Jesus conquered death so that we can look forward to a great reunion one day in our Lord’s presence. • It means that when we are sick and in pain, we can know that on Easter morning, Jesus conquered disease and that what we’re experiencing now is only temporary and we can look forward to a new body that will live forever. • It means that when we look around at some of the problems of this world and it seems hopeless, we can know that Jesus has conquered evil and is even now working through us to bring about a new day when poverty and hunger and war will be no more. • It means that when we are feeling unloved, lonely, anxious or depressed, we can know that on Easter morning, Jesus conquered loneliness and depression and fear, because he loved you enough to die for you, and that means your life has value. Whatever it is in your life that is holding you in its grip, you need to know that on Easter morning, Christ conquered IT – whatever IT is, and that you are free from the power it has on you. Doesn’t mean these things will go away – but that they no longer have power over us. Jesus’ resurrection wasn’t just an event 2,000 years ago. It continues in our lives today. We’re still part of the story. One of the reasons that I find Easter so compelling, is that it doesn’t promise a utopian existence. It doesn’t promise that life will be easy – in fact, for the disciples, their journeys will become much harder. This story would be so much easier to sell if it did promise those things. But Jesus made no such promise. What he did promise was that trust in him in the midst of the turmoil of everyday life would result in peace. What he did promise is that one day he would return to bring about the life that God had intended for us from the beginning – no more sin, no more suffering, no more disease, and no more death. What he did promise is that God still speaks into the emptiness of our lives, and brings forth new life. What he did promise is that we are not alone and there is much more to the story of our lives than whatever struggle we are experiencing right now. Because of Jesus’ resurrection, he has given the promise that he is alive and with us, and working in us, bringing real hope, real comfort, and real peace. And so we can sing with confidence, I KNOW that my Redeemer lives – not I hope, not I think, not I wish, not even I believe – but I Know that my Redeemer lives. And that, my friends, is the gospel truth.